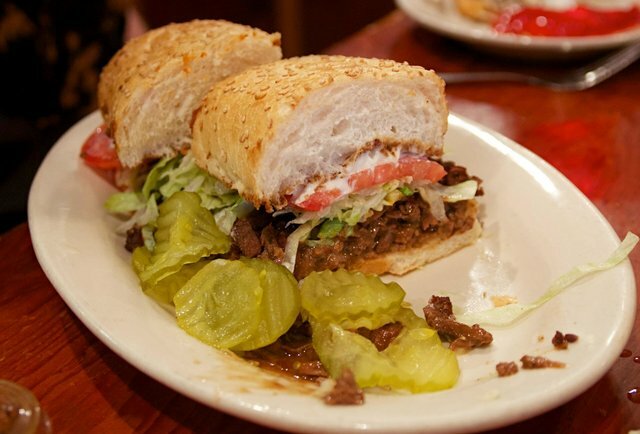 There are few things more synonymous with the Crescent City than po-boys. The humble sandwich has been adapted over the years, but we have also maintained the classics. 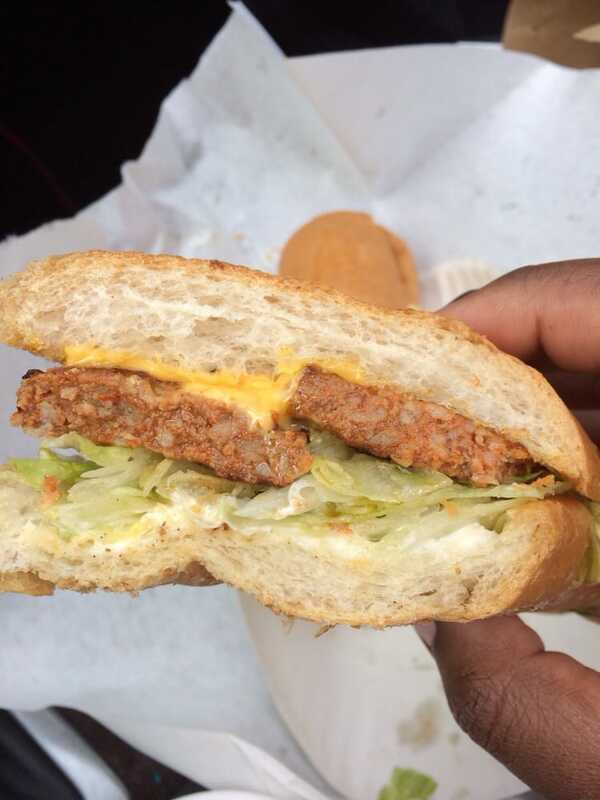 Although its origins date back to the 1800s, like many excellent foods that we have today—such as Middendorf’s fried catfish, meatloaf, and most wrapped candies—the po-boy was truly born out of the Great Depression. 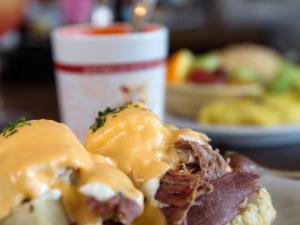 The famous sandwich is traditionally served on Leidenheimer, Binder, or Gendusa bread, but that doesn’t stop New Orleans eateries from using a variety of bakeries and bread. 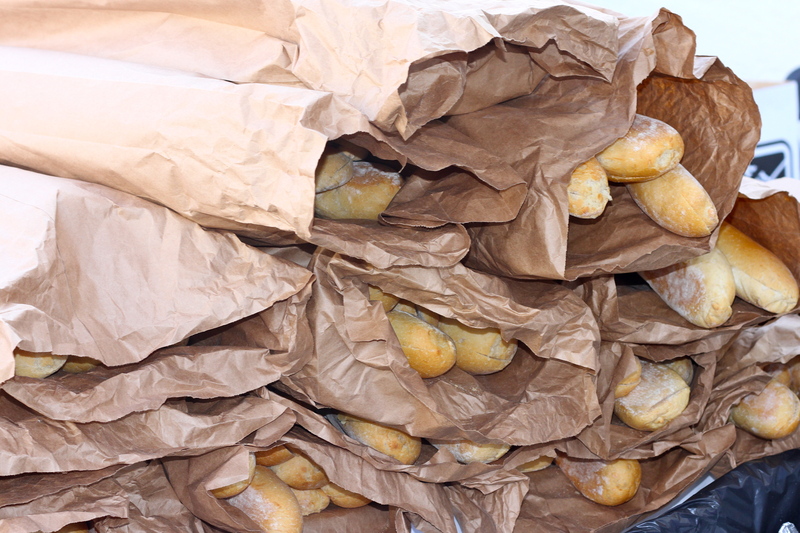 Most notably, the alternative to regular French bread is the Vietnamese French bread from Dong Phuong Bakery in NOLA East. The way it is “dressed” also varies. At some places, that means mayo (no thanks), shredded lettuce, and tomato. At other places, it means mayo (still no thanks), lettuce, tomato, onion, and pickles. And then there are Vietnamese dressed po-boys, which include spicy mayo (okay, maybe), cilantro (all of it), sliced cucumber, daikon, and carrots, often served with a pâté. However you like it, they can do it. So what is it that makes the French bread in New Orleans different from bread anywhere else? Well, it actually has to do with the elevation and humidity. New Orleans has an elevation of 6 ft. below sea level at its lowest and 20 ft. above sea level at its highest. Say you want to head 60 miles northwest to Baton Rouge and bake some French bread. Baton Rouge has an elevation of 56 ft. and is less humid than New Orleans. Not to get into the science too much, but the airy chewiness that you find in New Orleans bread comes from the yeast interacting with the dough, coupled with the way the dough rises. With the unique swampy elevation of New Orleans and its humidity, bread simply rises and bakes differently here. So, now that we know a little bit about why it can really only be called a po-boy in New Orleans, let’s get to the fun stuff. 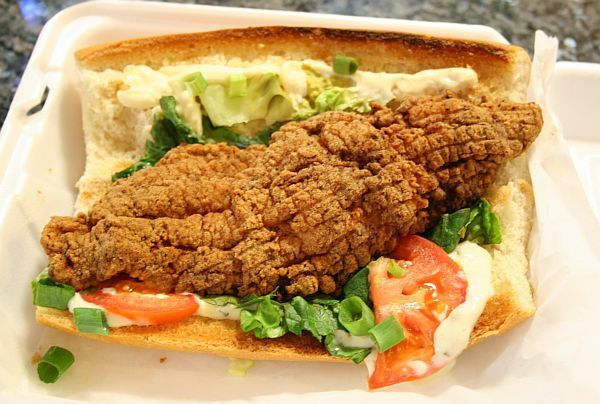 Perhaps the most iconic po-boy is the fried shrimp. The delectable crunchy sandwich is a fan favorite for both tourists and locals. The main difference from place to place is the size of the shrimp. You don’t want the shrimp to be too big because then they will all fall out. But you don’t want them to be too small, either, because then you’re basically just eating little fried bits, which I suppose isn’t the worst thing in the world. One New Orleans favorite has the shrimp po-boy perfected: Parkway Bakery & Tavern. For over 100 years, they have been overstuffing their po-boys with Louisiana wild Gulf shrimp, and they are simply divine. Head over to this beloved Mid-City establishment and grab a drink at the bar while you wait for your sandwich. Or, you can enjoy the patio while watching the Saints. You really can’t go wrong with anything on their menu, but their fried shrimp po-boy comes out with perfectly sized, golden brown shrimp. Close your eyes as you bite down, hear the crunch of the shrimp, and feel the chew of the bread. Yeah, it’s 50 shades of golden goodness. Pro tip: Come here on Sundays when almost all other po-boy spots are closed. If seafood just ain’t your thing, don’t worry. New Orleans is famous for their roast beef po-boys, shredded from the slow-cooking process and served with debris (jus). While you can find options for a variety of taste buds ranging from fried tamale balls to grilled tuna fettuccini, at R&O’s, it’s all about their famous roast beef po-boy. Since 1981, they have been the Bucktown restaurant of choice, with their home-cooked meals and po-boys served on sesame French bread. The roast beef po-boy is especially tasty. It comes with a literal mound of beef, with the bottom half of the toasted bread sopping up all that meaty excellence. The great thing about this restaurant is that you can take a walk along the lake after, to attempt to digest the humongous sandwich you just consumed. Every time I fly into New Orleans, I am hungry and sweaty. Well, that’s me most of the time. After having eaten “quality” airport food and visiting every bar for 10 hours while usually stopping in Atlanta or Detroit, I am ready to chow down when I land. There’s only one place I want to eat to get the taste of New Orleans in my mouth and the taste of airports out: Short Stop Poboys. 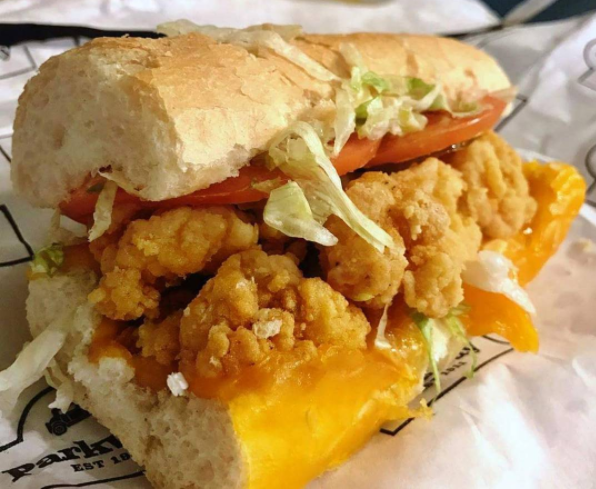 This Metairie joint is committed to serving the absolute freshest seafood po-boys in the game. 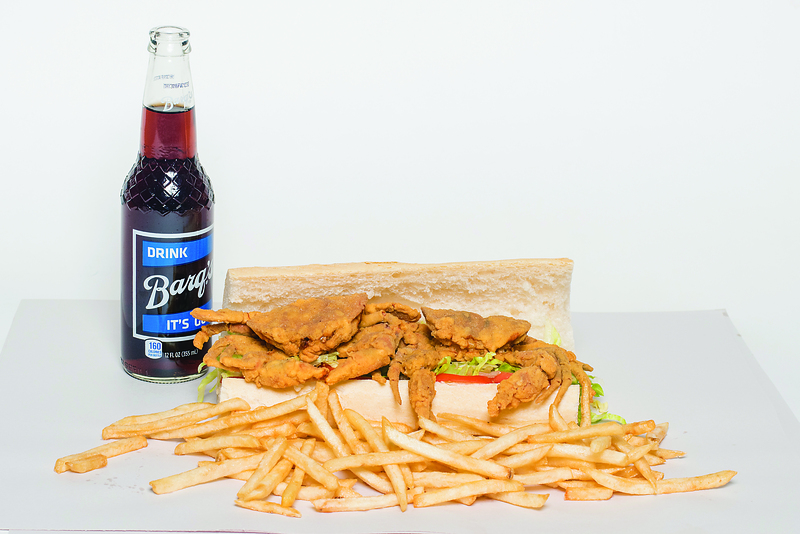 What makes them unique, however, is their year-round soft-shell crab po-boy that comes in three sizes. You can order a small, regular, or king. In case you were not familiar, a soft-shell crab is a culinary term for crabs that have recently molted their old exoskeleton and are still soft. Soft-shells are removed from the water as soon as they molt to prevent any hardening of their shell. Straight outta Wikipedia. The crabs are then deep or pan-fried and served with their delicious claws and legs hanging out of the bread. The other great thing about this spot is that relative to any other place serving soft-shell crab, it is incredibly cheap for this indulgent fried treat. Pro tip: Put some Zapp’s Chips and hot sauce in the sandwich for an extra kick and crunch. Again, for those of you who are unfamiliar, allow me to explain. Cochon de lait refers to a suckling pig, typically two to six weeks old. It is often roasted, then pulled, and served plain or, in New Orleans, on a po-boy or as a benedict. I am actually gonna have to call this one a tie between Walker’s BBQ and Katie’s. Walker’s BBQ is a cash-only counter service smokehouse east of the New Orleans Lakefront Airport. If you don’t feel like venturing out there, they are pretty much at every festival involving food. Located on Iberville Street in Mid-City, Katie’s is one of my favorite restaurants in New Orleans. Chef Scot Craig has perfected everything from a variety of benedicts to Bayou-inspired pizzas. But both of these institutions share something in common: unforgettable cochon de lait. They both serve it with a creole slaw. 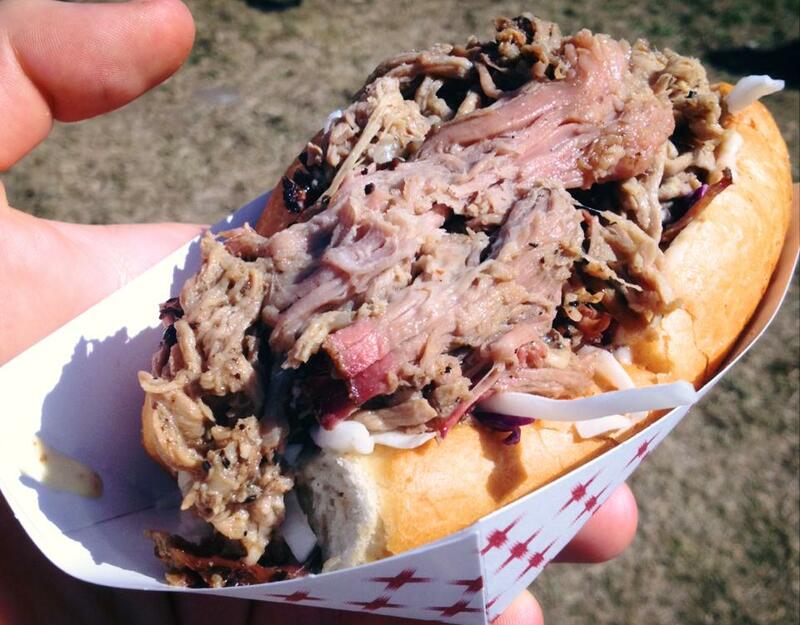 As you bite into this juicy masterpiece, you taste the smoke and see the pink hue around the shredded meat that can only come from quality smoking. It. Is. Amazing. Pro Tip: Head to Katie’s on Sunday for their $15 bottomless mimosas, Bloody Marys, and red and white sangria. Seafood and bacon have been a match made in heaven for generations. So it’s no surprise that the wonderful people at Mahony’s chose to put the two together with their Peacemaker. While this beloved Magazine Street restaurant tends to be a little pricier, it is well worth it. 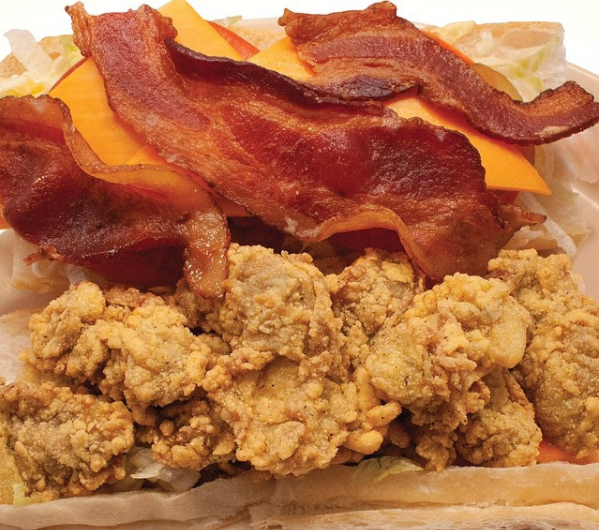 The Peacemaker comes with fried P&J oysters, cheddar cheese, and bacon, dressed as you like it. As you bite into this smoky, cheesy, briny goodness, you taste the ocean and the farm simultaneously like a beautiful symphonic harmony. Pro Tip: Get a half-Peacemaker and a half-Oyster with Brie po-boy for a variety of indulgent oyster flavors. Before coming to New Orleans, I can honestly say I have never heard of hot sausage before. In a state that loves its pork, it is rather strange to find a beef product at the center of its culinary culture. Ground beef is combined with heavy amounts of paprika and other spices to form an almost fluorescent orange patty. As the name suggests, the patties are very spicy. Sometimes so spicy you can't even put hot sauce on them. One restaurant in the Marigny is immediately recognizable for its vivid pink exterior: Gene’s Poboys. This 24/7-sandwich shop is a cheap and delicious local favorite. 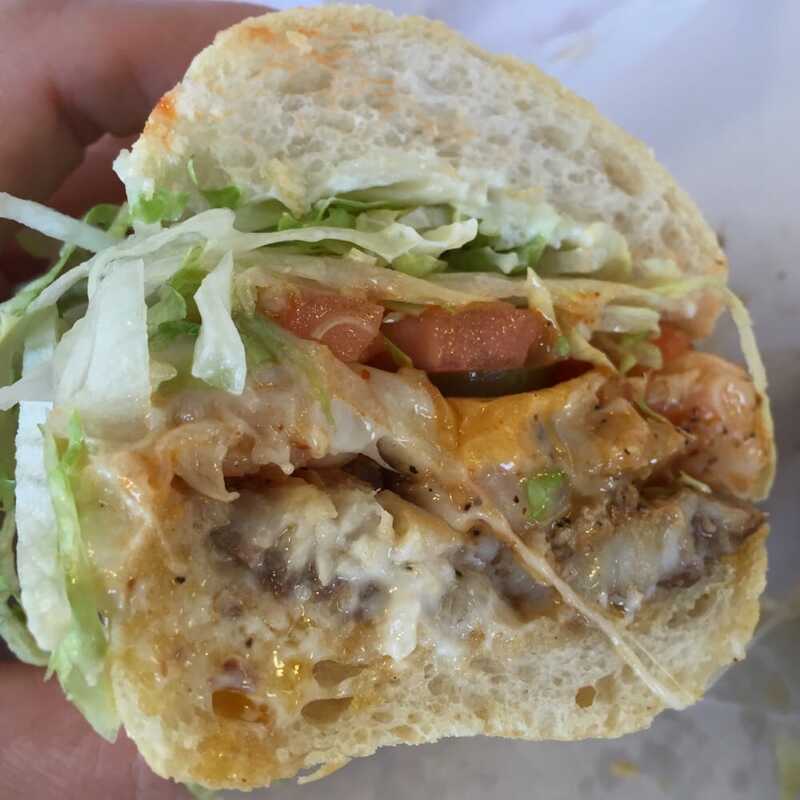 Those who know Gene’s know there is only one option: the hot sausage po-boy. While eating this mouthwatering sandwich, you might find yourself getting the sweats. If that’s the case, or even if it isn’t, head next door for their (strong as hell) daiquiris. Pro Tip: If you are still hungry and want to do a double take on the hot sausage, head over to Melba’s for another excellent hot sausage po-boy. While the king of thin-sliced catfish might be Middendorf’s, my favorite catfish po-boy is at Adams Street Grocery. Walk into this relaxed Uptown mini-mart near the corner of Adams and Plum Streets and enjoy the décor of metal beer and liquor signs lining the wall. I’m serious, it’s actually really cool. If you need to make some groceries or grab liquor, they got you covered. But walk to the back and say hi to Mary (just say John sent me) while you order what may very well be the best fish po-boy in New Orleans. Unlike most fried fish sandwiches, Adams Street cuts their catfish several inches thick, allowing the tender, flaky fried fish to melt in your mouth as you devour it before you even make it home. You better get there early, though, the kitchen closes around 3:00 p.m. and they get slammed for lunch every day by both Tulane students and construction workers. Pro Tip: Get the fried crawfish pie. It’s like an empanada stuffed with crawfish jambalaya. Just do it. Sometimes it gets difficult eating nothing but fried food on bread. Sometimes it doesn't. But if you don't want any more fried food but still want some gut-busting quality food on French bread, look no further. Just steps away from the Where Y'at office is an Uptown gem: Guy's Poboys. Their daily specials are superb as are all their po-boys. For the non-fried folks, turn to "The Bomb." Grilled shrimp and catfish are topped with melted cheddar and Swiss cheeses. Don't think that this is a healthy po-boy by any means, but it sure is delicious without being fried! Pro Tip: If you do want fried seafood, come Friday for their special platter of fried shrimp and catfish for only $13.95. It's HUUUUUGE! Best Breakfast: Bevi Seafood Co.